Department of Morbid Anatomy and Histopathology, University of Health Sciences-54600, Lahore, Pakistan. *Address correspondence and reprints request to: Muhammad Usman Shams, Department of Morbid Anatomy and Histopathology, University of Health Sciences-54600, Lahore, Pakistan. Shams MU, LAil RA, Ullah E, Nagi AH. Xeroderma Pigmentosum - a disfiguring disease: Single patient with 5 simultaneous tumors on face. Oman Med J 2014 May; 29(3). Xeroderma pigmentosum is an uncommon inherited autosomal recessive disorder. Affected patients have a 2000-fold amplified risk of skin cancer. There is an inability to repair the damage to genetic material caused by ultraviolet light. Basal cell carcinoma is the most commonly associated carcinoma followed by squamous cell carcinoma and melanoma. It is a highly mutilating disorder where occurrence of multiple cancers and repeated surgical treatments result in serious psycho-social implications. We present a case of diagnosed xeroderma pigmentosum in a 25 year old male who presented with multiple lesions and non-healing ulcers on face. Four surgical specimens from left lower eyelid, chin, right cheek and upper lip were taken for histopathological diagnosis. Microscopic examination revealed five different tumors from biopsies of these sites - specimen from right cheek revealed two morphologically distinct tumors. The tumors include basosquamous carcinoma, nodular basal cell carcinoma, adenoid basal cell carcinoma, malignant melanoma and cavernous hemangioma. 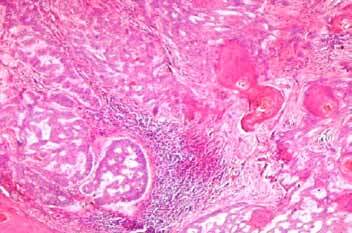 Keywords: Xeroderma pigmentosum; squamous cell carcinoma; basal cell carcinoma; malignant melanoma; cavernous hemangioma. We report a case of diagnosed xeroderma pigmentosum in a male of 25 years who presented with multiple lesions and non-healing ulcers on the facial area in May 2010. 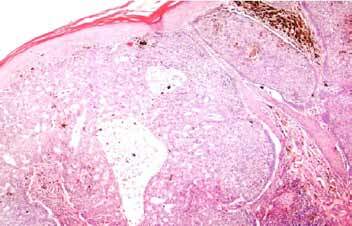 Five morphologically distinct simultaneous tumors were revealed during the microscopic examination of these lesions. Tracing the patient history; there was nothing wrong at birth. At the age of 1 year, parents noticed that the child was unable to perceive the surroundings and respond accordingly. Loss of eyelashes was also noticed. The child was evaluated by a number of ophthalmologists and a markedly decreased vision was established along with corneal opacification and mild keratitis. However, there was no improvement in the symptoms despite treatment and the cause of this decreased vision remained unidentified. One year later i.e. at the age of 2 years, tanning of skin and multiple dark spots were observed all over the body of the child. Six years later at the age of 8, the child had a surgical biopsy from skin lesions at left lip and cheek; it was reported as basal cell carcinoma on histopathology. Based on clinical examination and a strongly suggestive relevant history, the child was diagnosed as having xeroderma pigmentosum; however, tests for cellular hypersensitivity to UV damage and detection of defect in nucleotide excision repair were not done as they are time consuming, expensive and highly specialized. Clinical record available with the patient showed that he underwent surgery at 12, 13, 22 & 23 years of age on different sites including forehead, head, nose, lower eyelid, cheek and lower lip. The biopsies showed squamous cell carcinoma, basal cell carcinoma and hemangioma at different times. Nonetheless, the patient never had any neurological complaint nor did the available clinical record showed any such abnormality. Now at the age of 25 years, patient presented with photophobia and multiple lesions and non-healing ulcers again which were surgically excised. When examined light perception was intact but vision was severely impaired. Skin was dry parchment-like with obvious freckling. No neurological findings were observed. The specimen measured 1.5x1.0 cm and its histological examination revealed tumor cells with abundant cytoplasm and more marked keratanization as compared to typical BCC and there were distinct areas of squamous differentiation. (Fig.1.) Palisading was focally lost at places. 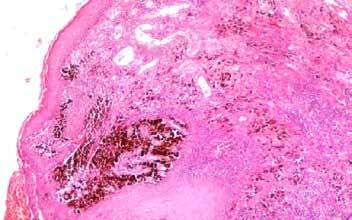 Ulceration was present and all the limits were involved by the tumor. The specimen, measuring 1.5x1.0 cm, revealed typical large lobules and bands of basaloid cells associated with scanty cytoplasm and peculiar peripheral palisading nuclei. Artefactual retraction was also present. (Fig.2). All the limits were involved by the tumor. Surprisingly, this specimen that measured 1.8x 1.2 cm revealed two distinct tumors. In one area, there were thin strands of basaloid cells in a reticulate pattern alongwith stromal mucin (Fig.3) while another area showed atypical melanocytes having large nuclei and nucleoli with abundant pale cytoplasm spreading in a pagetoid fashion throughout the epidermis (Fig.4). The distribution of melanocytes and melanin pigment was highly irregular. The specimen, measuring 2.0x1.8cm, showed poorly circumscribed collections of large ecstatic vessels (Fig.5). 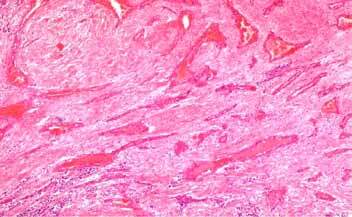 The vessels have thicker walls and occasionally contain intraluminal thrombi. 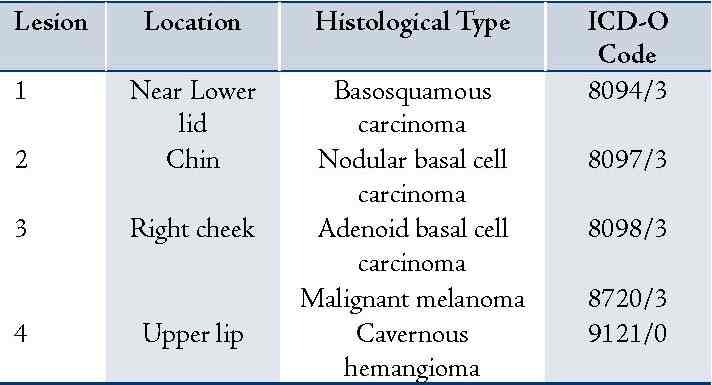 Table 1: Summary of location and five histological types of tumors with ICD-O codes, revealed from four lesions on face of an XP patient at one point in time. Basal cell carcinoma is the most commonly associated carcinoma followed by Squamous cell carcinoma and Melanoma,9 and in this patient we found two distinct types of BCC namely nodular basal cell carcinoma and adenoid basal cell carcinoma. The less commonly seen tumors in XP are keratoacanthomas, angiomas, fibromas and sarcomas,10 and an infected hemangioma was also present in this patient. A single lesion from right cheek revealed 2 tumors namely adenoid basal cell carcinoma and superficial spreading melanoma; such an incident has not been reported in literature before. 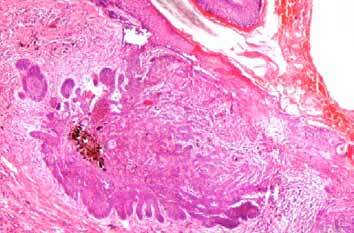 Lastly basosquamous carcinoma from a lesion near lower lid was also present, simultaneously. Three different types of tumors simultaneously in one patient have been reported by different studies worldwide.11-14 But here, to the best of our knowledge, we report the first case where five distinct histological forms of tumors were identified simultaneously on the face of a single patient. 1. Kraemer KH, Patronas NJ, Schiffmann R, Brooks BP, Tamura D, DiGiovanna JJ. Xeroderma pigmentosum, trichothiodystrophy and Cockayne syndrome: a complex genotype-phenotype relationship. Neuroscience 2007 Apr;145(4):1388-1396. 2. Kraemer KH, Ruenger TM. Genome instability, DNA repair and cancer. In: Wolff K, Goldsmith LA, Katz SI, Gilchrest BA, Paller AS, Leffell DJ, editors. Fitzpatrick’s Dermatology in General Medicine. Vol 7 ed. New York: McGraw Hill 2008; 977-86. 3. Ruenger TM, DiGiovanna JJ, Kraemer KH. Hereditary Diseases of genome instability and DNA repair. In: Wolff K, Goldsmith LA, Katz SI, Gilchrest BA, Paller AS, Leffell DJ, editors. Fitzpatrick’s Dermatology in General Medicine. Vol 7 ed. New York: McGraw Hill 2008; 1311-25. 4. Daya-Grosjean L, Sarasin A. The role of UV induced lesions in skin carcinogenesis: an overview of oncogene and tumor suppressor gene modifications in xeroderma pigmentosum skin tumors. Mutat Res 2005 Apr;571(1-2):43-56. 5. Kleijer WJ, Laugel V, Berneburg M, Nardo T, Fawcett H, Gratchev A, et al. Incidence of DNA repair deficiency disorders in western Europe: Xeroderma pigmentosum, Cockayne syndrome and trichothiodystrophy. DNA Repair (Amst) 2008 May;7(5):744-750. 6. Hirai Y, Kodama Y, Moriwaki S, Noda A, Cullings HM, Macphee DG, et al. Heterozygous individuals bearing a founder mutation in the XPA DNA repair gene comprise nearly 1% of the Japanese population. Mutat Res 2006 Oct;601(1-2):171-178. 7. Bhutto AM, Shaikh A, Nonaka S. Incidence of xeroderma pigmentosum in Larkana, Pakistan: a 7-year study. Br J Dermatol 2005 Mar;152(3):545-551. 8. Stary A, Sarasin A. The genetics of the hereditary xeroderma pigmentosum syndrome. Biochimie 2002 Jan;84(1):49-60. 9. Eugene DW, Joshi KD. Xeroderma pigmentosa–a disfiguring disease. Kathmandu Univ Med J (KUMJ) 2006 Jan-Mar;4(1):78-81. 10. Patil MR, Vishwanath V, Arya M, Shenoy BP, Bharmal RN, Torsekar RG. Pilomatricoma in a case of familial xeroderma pigmentosum. Indian J Dermatol Venereol Leprol 2007 May-Jun;73(3):198-199. 11. El-Hayek M, Lestringant GG, Frossard PM. Xeroderma pigmentosum in four siblings with three different types of malignancies simultaneously in one. J Pediatr Hematol Oncol 2004 Aug;26(8):473-475. 12. Green WH, Wang SQ, Cognetta AB Jr. Total-body cutaneous examination, total-body photography, and dermoscopy in the care of a patient with xeroderma pigmentosum and multiple melanomas. Arch Dermatol 2009 Aug;145(8):910-915. 13. Mohanty P, Mohanty L, Devi BP. Multiple cutaneous malignancies in xeroderma pigmentosum. Indian J Dermatol Venereol Leprol 2001 Mar-Apr;67(2):96-97. 14. Masinjila H, Arnbjörnsson E. Two children with xeroderma pigmentosum developing two different types of malignancies simultaneously. Pediatr Surg Int 1998 Apr;13(4):299-300.